One week has passed since the assault accusations against Syunik governor Surik Khachatryan were revealed to the public. On Monday, November 14, while leaving the Marriott Hotel in Yerevan Silva Hambardzumian, a businesswoman, was allegedly hit on the head by Khachatryan, who later denied any wrongdoing. Naturally, no one working at the hotel saw anything, not even the doorman apparently. The parliamentarian Khachik Manukian who happened to be there and purportedly witnessed everything according to Hambardzumian later said that he had arrived on the scene just moments after the incident of violence took place. Now the Special Investigative Service (SIS) is looking into the matter, although its unlikely it will hold Khachatryan accountable. The issue stems from an allegation made by Hambardzumian that equipment worth 100 million dram had essentially been stolen from her mine then found its way to a different mine owned by Khachatryan, and she passed blame on him, who besides being a regional governor is a feared thug (and, according to former defense minister Vasken Manukian, an “uneducated criminal”). Khachatryan is no stranger to controversy. He is believed to have embezzled about $1.5 million in state funds in 2008, as determined by the Audit Chamber of the National Assembly, and got away with it. Apparently Khachatryan is well connected to President Serge Sarkisian and has even been described as his “protégé.” He apparently ran an election campaign for the president’s brother Alexander in 2007. His relations with former president Robert Kocharian are also excellent. For these reasons alone, there is a very good chance that he will not face prosecution and walk away scot-free. Not unless, of course, the president wants to add to the credibility of his legitimacy. President Sarkisian has been cleaning house lately, forcing several high-level officials to resign. In the last month both the Yerevan mayor Karen Karapetyan and National Assembly president Hovik “Moog” Abrahamyan stepped down (the press insists they left their posts because of their ties to Robert Kocharian, who supposedly wants to run for president in 2013). 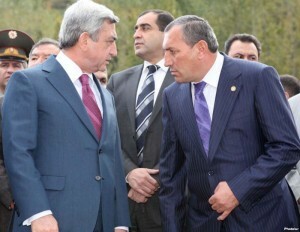 A year ago Sarkisian fired then mayor Gagik Beglaryan for slapping around one of his assistants. The president not only has to give the impression that he is not tolerating any nonsense from any of his officials, he also has to show the world that governmental corruption or ethical misconduct cannot be tolerated on any level. Prime Minister Tigran Sarkisian claimed that the authorities are waiting for a final determination from SIS before action is taken against Khachatryan. But the right thing for the president to do would be to replace the governor. The accusation of assault in a public setting is reason enough to fire him. The position of regional governor should be an honor to hold. But for Khachatryan, his post is nothing more but a conduit to do unchecked business and even get away with misappropriating state funds. President Sarkisian, do the Armenian citizenry good service by promptly sacking Khachatryan and make sure that his replacement will actually respect his governing role. Armenia certainly doesn’t need another mafia boss in a position of power. Yesterday just over a month after the government revealed its $2.5 million budget plan for 2012 Prime Minister Tigran Sarkisian explained just where the $268 million in tax revenues was to be generated. There are three primary sources it seems: from a tax on luxury automobiles, a tax hike on the upper class, and high excise taxes on expensive alcoholic beverages. First let’s look at the car tax. He proposed that the owner of a car estimated to be worth $90,000 or more be taxed, estimating the collected amount to reach around $2.6 million (1 billion dram). This expectation is a bit naïve thinking, however, since the number of cars priced that high is so infinitesimal that it will be hard to believe so much will be collected in taxes. There are ways around paying that “luxury tax” of course. Since the customs department determines the value of automobiles entering the country and the customs fees required to be paid using whatever mind-numbing algorithms they employ, it certainly wouldn’t be difficult to pay an official a bribe to set the worth of the car at $89,000, thereby avoiding the luxury tax. Then there’s the expensive alcohol tax – amounting to a 50 percent increase in excise duties. Fancy drinks like high-priced Cognac, haughty French wines and the like have a niche market, although the PM claims sales make up a 15 percent share of alcohol sold (naturally there’s no way of knowing where he got that number from). I’ve only seen expensive liquors and wines at SAS supermarket, which caters to Yerevan’s nouveau riche as well as foreigners working in the country. It’s hard to believe anyone – a visitor or a local – would be willing to pay several hundred dollars for wine when a five-buck bottle of Areni will suffice most tastes. In other words, the PM shouldn’t expect much tax revenue from the food and drink business sector. The proposed tax hike from 20 to 25 percent of income for anyone making at least $5300 a month is intriguing. It’s safe to say that anyone making a salary that much or higher is not properly reporting their annual worth to the tax authorities anyway(if at all), and again, paying them a bribe to avoid paying higher taxes will not be difficult. Even if he decides to crack down even more on small and medium-sized businesses (a.k.a., ordinary people trying to make a buck) than he already has, it’s hard to believe he’ll be able to collect very much additional tax revenue from them since they’ve been squeezed to the breaking point. I’ve been seeing many vacant stores recently in Yerevan, and low sales may not be the only determining factor in the decision to close shop. The head of the State Revenue Committee Gagik Khachatrian has yet to be convinced that the funds can be raised with the PM’s plan. He’s been expressing his concerns about the new budget and the government’s anticipated ability to hit its target since the 2012 budget was unveiled on September 29, claiming that there was no way it could collect so much in tax revenues with its current focus. What’s strange is that there’s really no intent in store to properly tax the oligarchs. Why doesn’t he simply go after the multimillionaires? Probably because that will mean he will ultimately have to tax himself. Perhaps the Prime Minister really expects to collect the $268 million through the established system of bribery in place. Khachatrian is certainly right – on the surface of things the expected numbers just don’t add up.